This lesson can be used as a pre-lesson for the Multiplication Bingo: Two-Digit Numbers lesson plan. Students will be able to describe and explain the lattice strategy for multiplication using sentence starters and partner conversations. Show students the vocabulary card for lattice. Read aloud the definition and describe the image. Ask students to turn to a partner and talk about when and where they have seen a lattice structure or pattern before. Examples may include fences, quilts, or artwork. Invite a few students to share their conversations about lattices. Explain to students that today they will hone in on one strategy for multiplication called the lattice strategy. Have each student work with a partner to restate the definition in their own words and describe the image as it relates to the meaning of the word. Instruct students to use the word in a sentence and share the sentence with their partner. Circulate to listen in on students' conversations. Display the How To Do Lattice Multiplication worksheet on the document camera. Explain to students that they will learn how to use this strategy with a one-digit by two-digit multiplication problem first before practicing with two different two-digit factors. Read aloud each step and walk students through the process using the worksheet as a guide. Remind students to ask questions about any unfamiliar terms or steps they don't understand. Instruct students to restate the steps to a partner as you model them. Distribute whiteboards and markers to students. Model how to draw the squares and diagonal dotted lines to use the lattice strategy. Make sure students have drawn the squares correctly before assigning them the problem: "Mr. Dodson has 47 boxes of erasers that were donated to him from a friend. Each box contains 8 erasers. How many erasers are there in all?" Tell students to solve the problem using lattice multiplication with their partners on the whiteboards. Remind students that they must each solve the problem individually, but they can work together on the solution process. 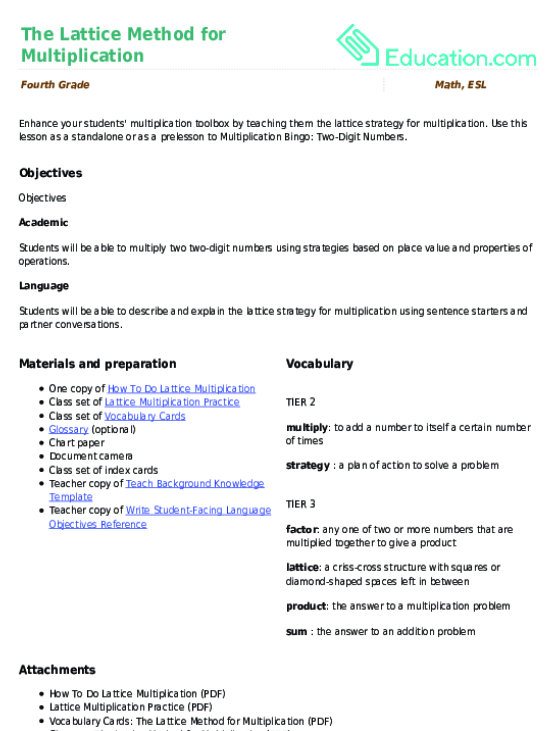 Review the problem as a whole class, recording students' explanations on a piece of chart paper titled "Lattice Multiplication." Tell students that they will now try this strategy with two-digit factors. Distribute the Lattice Multiplication Practice worksheet to students. Model how to do the first problem on the document camera. Create a word problem or scenario to match the multiplication problem to give it more context for students (e.g., "There are 30 rows in the theater and each row seats 12 people," etc.). Speak aloud and describe each step you do in the sample problem. Assign students the second problem on the worksheet and tell them to continue working with their partner to solve it using the lattice strategy. Provide the following sentence stems for students to refer to as they describe the steps. "To get the final product, I..."
Place students with a new partner and have them share their solution verbally with this partner. Tell them to compare their solutions and work out any differences if they occur. Add any key points that students discussed to the "Lattice Multiplication" chart paper. Tell students to solve the remaining four problems on the worksheet with their new partner. Circulate to offer assistance as needed. Have students return to their first partner and have them take turns presenting their lattice solutions for problems 3–6. Allow students to do the formative assessment in collaboration with a partner. Let students state their anwers verbally instead of writing them down. Create and display a word/phrase bank with helpful terms from the lesson for students to refer to, with images if applicable. Provide sentence stems/frames, as applicable, for the Review and Closing section. Have students restate the main learning points of the lesson before doing the group work. Provide students access to home language resources, such as bilingual glossaries or online dictionaries, to help them understand the meaning of the terms used in the class. Pair students with more advanced students or other ELs who speak the same home language (L1) for partner activities and for group work. Instruct students to be the first to explain their thinking in group or partner work. Have students describe their math processes without relying on the sentence stems/frames. Encourage students to rephrase the directions throughout the lesson. Tell students to describe their solutions to a partner. Listen in on their explanation of the solution process and add to the "Lattice Multiplication" chart from the guided practice section of the lesson. Point out to students how their explanation of the strategy became clearer and more specific as they had more practice with using the method for multiplication. Congratulate them for using correct math terminology in their explanations. Have students share their responses with a partner before calling on a few non-volunteers to share their thoughts with the whole group. Remind students that it is generally helpful to know multiple ways to solve a problem so that we become flexible math thinkers and can understand the reason behind each step to solve a problem. Lattice multiplication worksheets are great for visual learners working on two-digit multiplication. Try this lattice multiplication worksheet with your child. 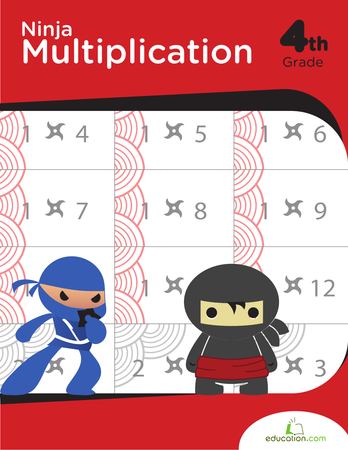 Help your little math ninja work on two-digit multiplication using the lattice method. Get some practice with the lattice method, a great alternative for kids who struggle with the traditional method. 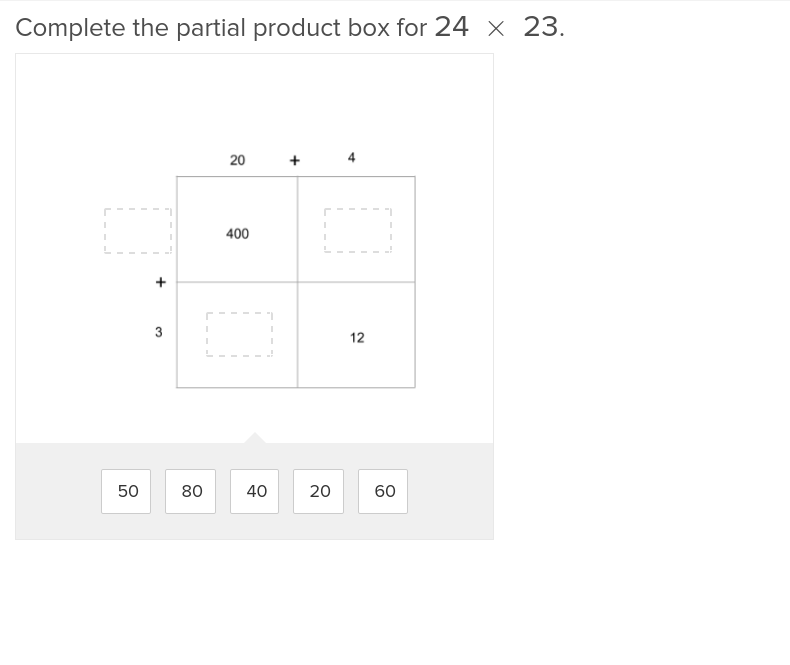 Break down multi-digit multiplication with these exercises that lead students step-by-step through the partial product method. The partial product method is a foundational part of math instruction in the upper grades.